One of the really awesome things that has come of being a book blogger for nine years and a children's bookseller for six is that I get sent swag, made to help promote and create buzz around books being published. 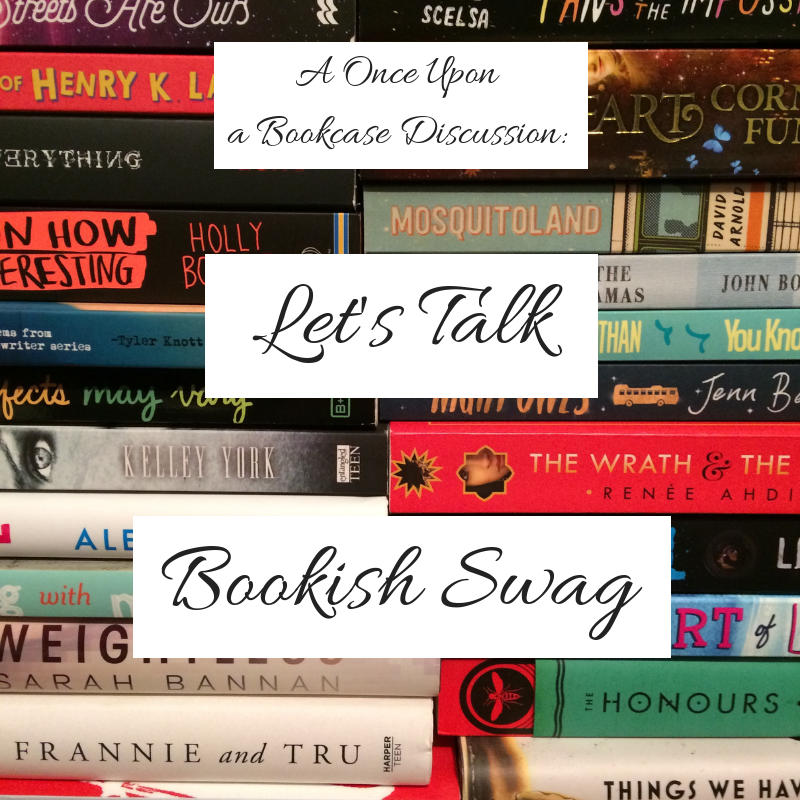 Over the years, I have acquired quite a larges collection of bookish swag, and thought today I'd discuss the various kinds of swag, and my opinions of them! Who doesn't love a tote bag?! I have to say, tote bags are probably my favourite. They're just so handy and useful! And I have so many! Here are just a few I have, but I have loads. I have a bag full of tote bags. Most of them come to me through being a bookseller, but I get a few as a book blogger. I do love them! Tailored promotional swag is promotional material created specifically for a particular book. Bookmarks, postcards and badges are quite typical promotional material, but when a publisher goes that extra mile to create something specific and special, it's really awesome. And, for me, it has me a lot more interested in the book; if the publisher is going that extra mile, then the book must be pretty awesome, right? It's memorable, so you remember the book. It's quite clever, really. The Graces by Laure Eve - A candle an two feathers, plus a quote note, for this witchy book. For a Muse of Fire by Heidi Heilig - I didn't actually get this from the publisher, but from Heidi as it's pre-order campaign goodies! Sheet music and a signed bookmark, plus I was also emailed MP3s of the songs in the book! So awesome! Song of the Current by Sarah Tolcser - A wooden ship's wheel and a tiny rolled up map in a corked bottle! I was an idiot; when I looked at the map, I couldn't fit it back into it's ties, so just popped it back in the bottle without. But it's unrolled too much for me to actually get it out the bottle now without damaging it. Ugh. My Secret Rockstar Boyfriend by Eleanor Wood - I love this! It's a cassette tape case, and a USB card designed to look like a cassette, featuring extra content. Just awesome! I've got to say, I do love badges, and as enamel pins have become more popular, I think they're pretty awesome, too! However... I don't really know what to do with them all? I know some people put them on tote bags, but I think that can ruin the look of a tote, plus I'd be worried about catching them on something and tearing the bag. Plus I have too many. What you see here is just a selection. What do you do with your badges and enamel pins? I think these are pretty cool. With Stealing Snow, as a retelling of The Snow Queen, shards of mirror are pretty integral to the story (at least they are in the original - I didn't finish the book as I wasn't enjoying it), so having a compact mirror works. And they're handy, too! As someone who suffers from migraines, which are triggered by strong scents, scented candles are the bane of my life, and I cannot stand them. Even if they didn't trigger a migraine, I wouldn't like them, because they never smell nice! I also don't really see the point. Only in a few cases is a scent applicable to a story - I'm thinking of Fangirl, and that drink Cath always has, so a candle that smells like the flavour kind of makes sense. I think the Geekerella candle probably works, too, because it's pumpkin, I think, and as a Cinderella retelling with a Magic Pumpkin food truck. But otherwise, why? WHY?! I know there are online stores that sell bookish scented candles, and I do not understand why! If there is nothing in the book that relates to a flavour or a smell, what do candles have to do with books? I don't get it. I don't want them, either. They end up being given away. Now, in theory, I love free samplers. Extracts before we get to read the book, how exciting! Give me them aaaaall! But when it actually comes down to it, I don't want to read them, because I'll just end up wanting to continue the story, and can't. I don't read extracts posted online for the same reason. But, illogically, I want them. In theory, card holders/wallets are pretty cool. Useful! But... I like a pretty card wallet. I Have Lost My Way is kind of pretty, Genuine Fraud is not. Kind of boring. But I am a swag magpie, so I'm all, "Oooh, useful!" and I keep them. I... do not understand lanyards. I have these two, but I don't know what the point of them is? Get rid of the plastic cards and keep the lanyards, because they can be useful, but as a whole... why? I'm not going to wear them. I get that they relate to the books in that their passes - a pass needed for Wundersmith, and a VIP pass for Love Song, which has to do with a band. But what am I, the reader, meant to use them for? Gimmicky, I guess. But they're still kind of cool! Trading cards for The Spectacular Sisterhood of Superwomen and Smoke Thieves. As someone who has never been interested in trading card games, I am completely indifferent to trading card swag. I get it in the sense that they're fairly unique, and can maybe tell you more about the characters, and that's quite cool... but I'm generally not that bothered. These two were sent to me along with the books, which is why I only have two. They're not something I would take home if I got sent them at work. UNLESS they were for a book/series I adored, and the artwork was just beautiful. I would absolutely want to have Strange the Dreamer trading cards. Because miniature works of art. I don't know what I think about temporary tattoos. Morganville Vampires is a teen series, Strange the Dreamer is kind of teen, and the other is as well (though I can't remember what book they're for, but I know it's YA), and I guess maybe teens like temporary tattoos? But I don't wear them. I'm probably the wrong audience. That said, LOOK at theat Strange the Dreamer moth tattoo! It's beautiful! And I love it! I'm not really one for stickers, either. Again, I just don't know what to do with them? I don't use stickers. Though I can understand teens might want to use them to decorate things. But the two at the top, Martyr and Incubus? They're for adult novels, so I'm confused as to why there are stickers? But look at Minya from Strange the Dreamer! Look at that artwork! Gorgeous! Oh, postcards! I have so many postcards! And I don't do anything with them except look at them. Some of them are just so gorgeous, featuring cover art, and I think, once I have my own library, maybe I'll put the most pretty in tiny frames and hang them on the wall! I get postcards when it comes to readers in bookshops. Something they can pick up to give them more info about a book and interest them. But as a book blogger who gets emailed info, I'm not quite sure why we're sent them. But I love them, and will always be a magpie for them! You can never have too many bookmarks! Except for the fact I don't actually need this many. This is just a selection, and I probably have more bookmarks than I have books to put them in. But, like the postcards, they work for telling readers in bookshops more about a book. They're also handy. I'm always using bookmarks. So it's great to have them, but I generally just use the same ones over and over until damaged. And yes, it's great to have others to grab a new one when needed. But I really don't need loads. But I have loads. An I will always add to my collection, because you can never have too many bookmarks, no matter how illogical it is to have a whole bunch! What I haven't included in this list is lip balm - because I have only one, for Genuine Fraud, and it would look quite lonely in a photo on it's own - and posters - because they're huge, and it was hard enough taking a photo of the tote bags. But I do love a poster. Again, they will decorate my future library. The lip balm isn't used for the same reason I don't use the candles. Smells. Over to you guys! What do you think of bookish swag in general? Love it, hate it? What's your favourite kind of swag? What swag do you not understand and/or not want? And be sure to tell me about all your prized possessions! This post was inspired by this week's Top Ten Tuesday topic: Bookish Items/Merchandise I’d Like to Own. I have never been on the receiving end of any of those cool promo boxes, but they are pretty amazing sometimes. When I went to cons, I always grabbed tons of totes, because you never have enough of those. Aah, I've never had any promo/subscription boxes. 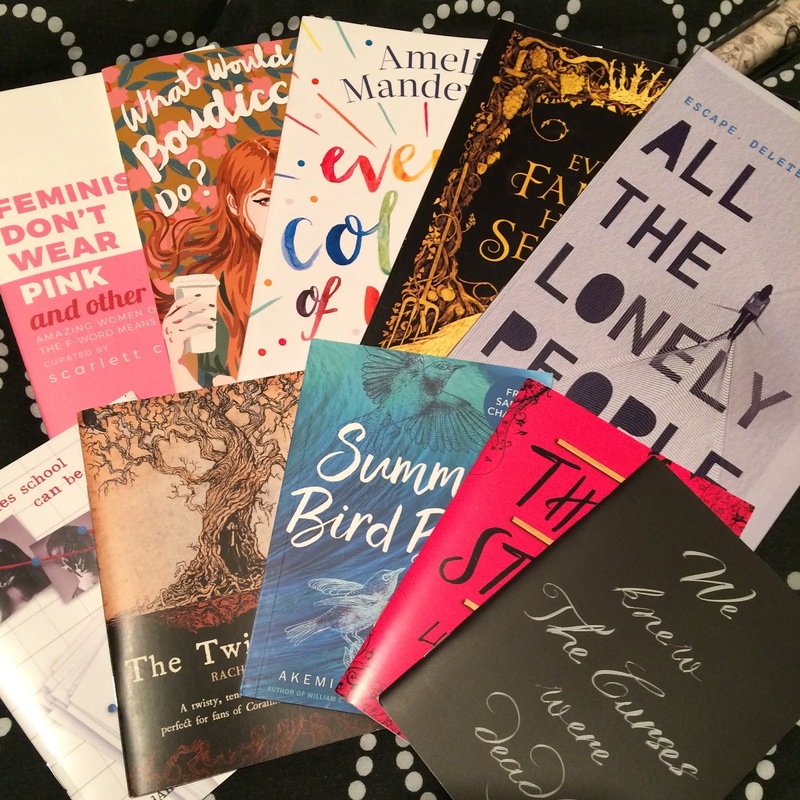 Most of these have been sent to me along with a book/because I'm a bookseller/were picked up at YALC. Totes are amazing, and I love them! Wow, who knew there were so many different types of swag!? I have less use for the tote bags than you, but would totally love to have the candles! Though to be fair, they don't give me migraines, so maybe that's why. I do a lot of geocaching so I would leave the pins in various geocaches and I would totally send the postcards to some of my pen pals. And the bookmarks, like all of the bookmarks that I buy regularly, I would use them once before losing them. As well as giving me migraines, I think I'm just really fussy when it comes to scents. I just don't like most - even perfume or aftershave - even if it doesn't give me a migraine. Scents aren't my thing. But I do love totes! Especially as we get charged for bags here now. The only types of swag I really like all that much are buttons/enamel pins and bookmarks. I put my buttons and pins on a tote. I guess I might possibly rip the tote, but I have so many of them that I've never really worried about that. I don't have room to keep a lot of the other stuff---posters seem neat, but they usually end up getting all bent up and such. And I do like totes, but like I said, I have a million! I do really like the cool tailored swag, though. One of my favorite swag items is a Three Dark Crowns deck of cards. I don't use them, but I have them on display on my bookcase. In my head, when I have my very cool library, which will mean I have lots of money, I'd frame the posters before putting them up. So no bent corners! But of course, that's not really likely to happen. Lol. And as for room, all my swag (bar totes and most bookmarks) is kept in one shoe box. I mean, it all tends to stay in there doing nothing, but doens't take up too much space fortunately. Ooh, those cards sound so cool! It's really awesome when publishers go that extra mile to promote a book! Wow, I had no idea how much bookish swag is out there...I think this post made me realize I'm not a fan, haha. Just give me my books! :P I do have a few Tolkien swag-like things (the Ring, a necklace with The Hobbit cover on a charm, a mug with a Middle-earth feel), so that'd probably be my one book 'swag' vice. I like enamel pins as well, but I also don't know what to do with them so I don't buy them. Aah, I don't buy most of my swag. I think that's the difference; swag is promotional, and then there's merchandise that you can buy. I'd say what you have is merch. So I've not baught my enamel pins. I just like looking at them, ha. Ooh, I see! I don't have any swag then, I think :P Although I'm going to an ALA conference this weekend so I might pick some up!